The origin of the term stems from Homer’s The Odyssey, in which the goddess Athena assumes the guise of Mentor, to counsel and guide Odysseus’s son, the youth Telemachus. Yet although this may be where the name originated, the role of the counselor and wise guide is popular in myth and folklore. Other examples include the centaur, Charon, who raised Jason (of the Argonauts and Golden Fleece fame), and of course, Merlin, who guides the young Arthur. Later in the Arthurian cycle, the wise counselor role is sometimes assumed by Vivian, the Lady of the Lake, and the enchantress Nimue. In fairytale and folklore, the mentor and wise counselor may also take the form of an animal companion, such as the horse Falada in The Goose Girl fairytale or the cat in Puss and Boots. In some cases, too, the mentor figure is drawn from the fairy realm. Although this includes Merlin, Vivian, and Nimue, another famous example is the fairy godmother in Cinderella—and godmothers plural in Sleeping Beauty, although its the final one that counts in changing the death spell into the hundred years’ sleep. 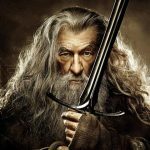 In terms of classic mentor figures, Gandalf the Grey in The Hobbit and The Lord of the Rings and Brom in Christopher Paolini’s Eragon, both fit the bill. Although less powerful, Keyoke and Nacoya (Mara’s nurse turned First Counselor) in Janny Wurts and Raymond E Feist’s Daughter of the Empire also represent the tradition. Other famous examples include Belgarath the Sorcerer in the Belgariad, Moiraine in the early Wheel Of Time novels, and Count Brass in Michael Moorcock’s Chronicles of the Runestaff. I can’t overlook Albus Dumbledore in the Harry Potter series, but I would also cite Luthe in Robin McKinley’s The Hero and the Crown, Deth in Patricia McKillip’s The Riddlemaster of Hed, and Aidris’s hidden grandmother in A Princess Of The Chameln. Jasnar Kholin is clearly a mentor and preceptress to Shallan in Brandon Sanderson’s Stormlight Archive series. Yet Shoka, in CJ Cherryh’s The Paladin, may qualify in his role as swordmaster to Taizu, but his motivations are so murky otherwise that I feel he’s a suspect candidate overall. In many ways, Nahadoth in NK Jemisin’s The Hundred Thousand Kingdoms occupies a similarly uneasy role: he is both the sworn enemy of Yeine’s Arameri family, but must teach her the secrets of both her personal and family’s power. Sometimes, too, the mentor may turn out to be undertaking that role for reasons that entirely benefit him or herself as opposed to the mentee. A classic example of this is Mr Wednesday in Neil Gaiman’s American Gods. Merlin was far more human and less magical in Mary Stewart’s Arthurian series than in the legends, but he still fulfilled the traditional mentor role to Arthur in The Hollow Hills. When it comes to fairy or otherworldly mentors, however, Felicity Fortune in Elizabeth Ann Scarborough’s Godmother series is a quintessential example. Another valid contender, imho, is the immortal, River, in Cate Tiernan’s Immortal Beloved, as is the witch, Maelga, in McKillip’s The Forgotten Beasts of Eld. The Forgotten Beasts of Eld also gives readers a magical animal mentor in the character of the talking boar, Cyrin. In Tolkien’s The Hobbit, a thrush tells Bard where to aim his arrow so it will find the only weak spot on the armoured body of Smaug the Dragon. Thornspell, which is a retelling of Sleeping Beauty from the perspective of the prince, has several mentor characters. The primary one is Balisan, the prince’s swordmaster and protector. Syrica, the fae who transformed the death spell into the hundred-years’ sleep, also plays a mentor’s part in the story, as does Auld Hazel, the witch of the wood, although to a lesser degree. The Wall Of Night series has plenty of mentor and wise guide roles, too, particularly in the first book, The Heir of Night, when both Malian and Kalan, the principal characters, are very young. The primary mentors for Malian are the minstrel, Haimyr, the Honor Captain, Asantir, and the dead hero, Yorindesarinen. In Kalan’s case it’s the Huntmaster (who appears with a Wild Hunt), but Yorindesarinen also provides some guidance to him as well. Yorindesarinen reprises her mentor role to Malian in The Gathering of the Lost, but only in a minor way. The story’s primary mentor characters are Lord Falk of Normarch, Manan the Innkeeper, and the hedge knight, Raven—all of whom are encountered on the wild northern march of the Duchy of Emer. In Daughter of Blood, Malian largely stands on her own feet–as does Kalan, while himself becoming a mentor figure for the street urchin called Faro. Myr, the Daughter of Blood of the title, has a former governess-turned-duenna called Mistress Ise, to whom she has always looked for moral guidance. She also obtains support from Asantir and also Nimor, the Sea House envoy, at different times in the story.